Memorial Day is behind us, and the gardens are really starting to fill out. All new types of plants are beginning to bloom- peonies, Baptisias, poppies, irises, Clematis, early roses, and so much more. This is an exciting week here at Natureworks. We are restocking from a totally insane weekend AND we are gearing up for some great FREE workshops and garden walks in the next few days. On Thursday evening, I will be talking all about how to grow, prune, and care for Clematis vines. This winter I totally redid our Clematis handout. Click here to link to it on our website. This plant causes such confusion. Let me help you sort out the different categories and pruning techniques. Learn where to site them, how to feed them, and how to prevent diseases. Our Clematis plants this year are big, blowsy, and simply gorgeous. 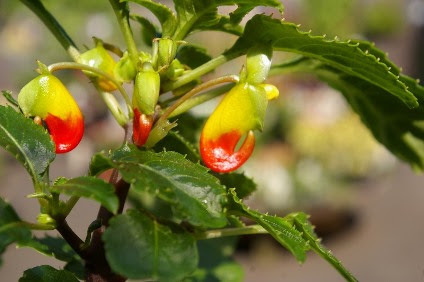 ‘Congo Cockatoo’ impatiens will really jazz up your summer shade garden! Saturday morning, my garden walk will feature weaving unusual annuals and tender perennials into your gardens and containers. At Natureworks, we specialize in perennials and flowering shrubs but that doesn’t mean we don’t plant tons and tons of annuals. We use them to embellish our creations! They offer constant color. Many attract hummingbirds and butterflies. I will be filling a wagon with some very special and unusual plants you may not yet know about. Then I will be wandering through the gardens, showing you how I would incorporated them to either double the color or add texture and foliage structure. This will be a good walk if you want to better understand design. ‘Coral Fay’ is an early peony that has been blooming in our gardens for a week. Are your peony hoops on yet? We have them in stock, don’t delay. A t 11:30 I will be adding a SURPRISE workshop in honor of many of the plants that grace our gardens this week: Growing Old Fashioned Flowers. Iwill explain how to grow poppies, peonies, and irises. These top three perennials deserve a place in every yard. They are very hardy and will live for years. I have many clients that have peonies from their mother’s or grandmother’s gardens! 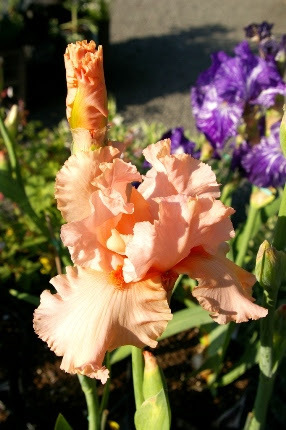 Irises take center stage this week. Learn about all the different types at our surprise SECOND Saturday workshop at 11:30. I have irises and peonies from Lucie Carlin’s Guilford cottage garden. Each year, when they flower, I think fondly of my dear friend. 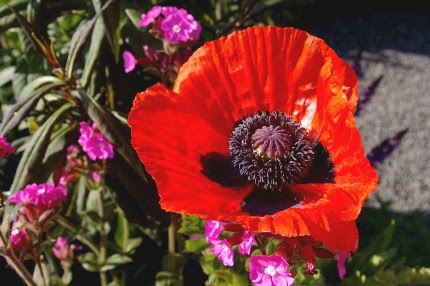 Did you know that oriental poppies go dormant in the summer? 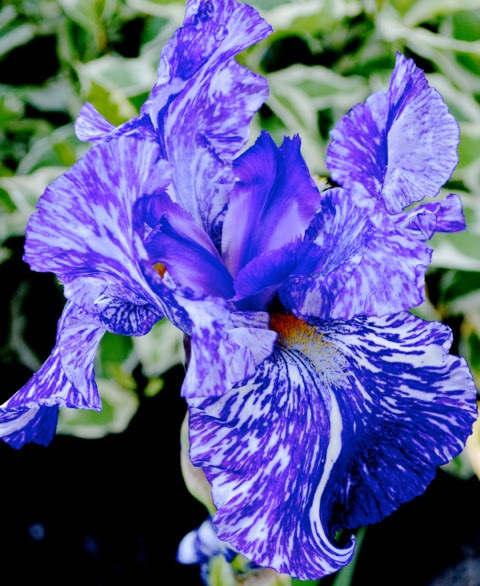 Do you know the difference between bearded, Siberian, and Japanese irises? 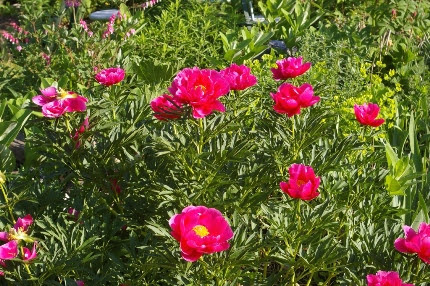 Do you know when to transplant peonies and how deep to plant them? These are BASIC gardening practices. Join me and learn! The discussion continues here at Natureworks, on Facebook, and on the internet about the effect of neonicotinoid insecticides on bees and butterflies. 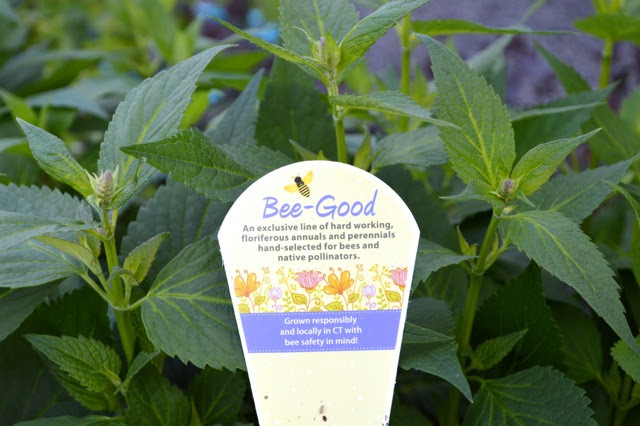 One of our growers has put this tag in her line of bee friendly plants. This is the exact type of plant we carry and the type of grower we seek to stock our benches! Kudos to this local CT grower for seeing the importance of growing a safe plant and letting the consumer know it was responsibly grown! This is a drastic difference from the big box store labels we have seen posted saying the plants were treated with systemic pesticides! The plant shown here is Anise Hyssop or Agastache and it is a bee magnet! It will have purple blooms soon and looks great in a bee and butterfly friendly garden. We are a fully committed organic garden center and do our research. We ask our growers what they use on their plants, we do not sell chemical pesticides or fertilizers. Never have, never will. Growing safe gardens 100% organically IS possible and the way nature wants us to do it. 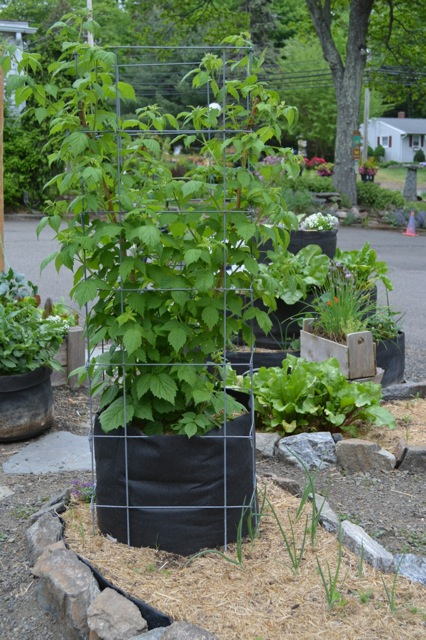 Do you have your tomato cages on yet? We have American made, heavy duty cages that will last you for as long as you grow food. We will be restocking our Incredible Edibles benches again this week. I spent a glorious day on Sunday planting dozens of tomatoes, peppers, eggplants, melons, squashes, and herbs in my raised beds. I am not done- I will continue to plant all summer. I am eating lots of fresh lettuce right now. As that is done, I will replace it with chard and beans and late sowings of squash and cucumber seeds. Plant dill plants AND seeds at the same time. When the plants bolt to seed, the second crop will be emerging. 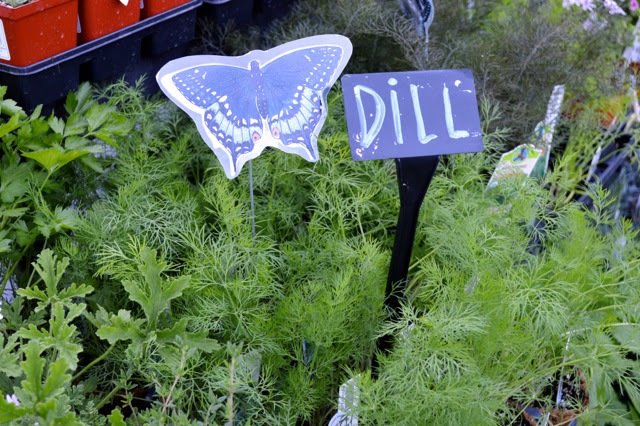 Dill is an important larval food plant for Eastern black swallowtail caterpillars. I haven’t staked or caged my tomatoes yet. I am replacing my old, flimsy wire cages with our high quality, heavy duty cages shown above. It makes a big difference if you set the food garden up and make it easy to care for from the beginning. We would like to thank all of the CT Garden Club members who visited Natureworks last week for Garden Club Appreciation Week. 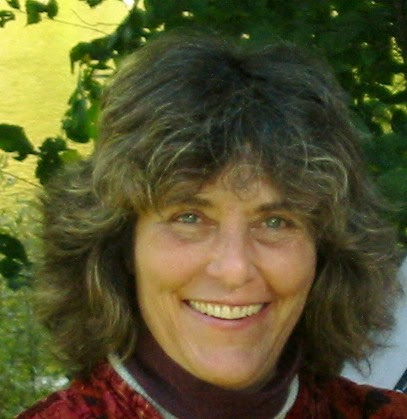 The winner of a $25 Natureworks gift certificate was Barbara S. from Guilford. Congratulations Barbara! This is PRIME TIME to come and visit. The gardens are bursting with color, the benches are stocked to overflowing, and the weather promises to be ideal all week long. P.S. The weather is ideal, but we DO need rain. Be sure to deep soak important trees, evergreens, and shrubs that have been planted in the past year. As you add new plants, “puddle them in”. That means fill the hole with water (we add Organic Plant Magic to the water every time) and then add the plant. Put wells around every plant to hold the water that you add. Mulch thickly to conserve water and cut down on weeds.